The latest retail space from Australian skincare brand Aesop has opened in Rome, with a design crafted in homage to some of the city’s ancient volumes. 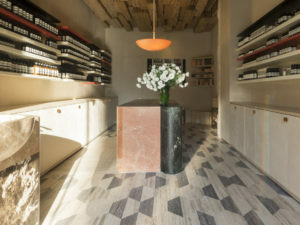 The company partnered with screenwriter and film director Luca Guadagnino to design the store with elements such as weathered stone, rosy marble, and straw. The studio did away with the false ceilings and blocked windows of the former lighting store, while also adding rhombus-shaped travertine floor tiles in dark gray and off-white hues in homage to the nearby San Lorenzo church. The central counter is built from dark green and rosy marble, illuminated by a singular pendant lamp that emits an orange glow. Two standalone basins are also installed with copper faucets along with cream-colored, lacquered wood shelving.